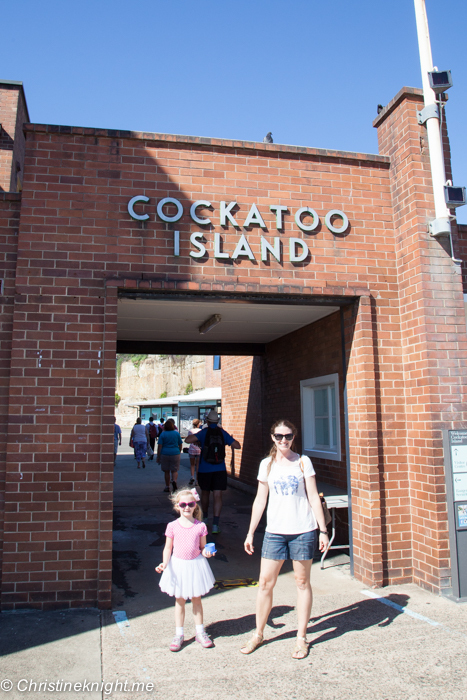 Travel Guide: Visiting UNESCO World Heritage Site Cockatoo Island - Adventure, baby! 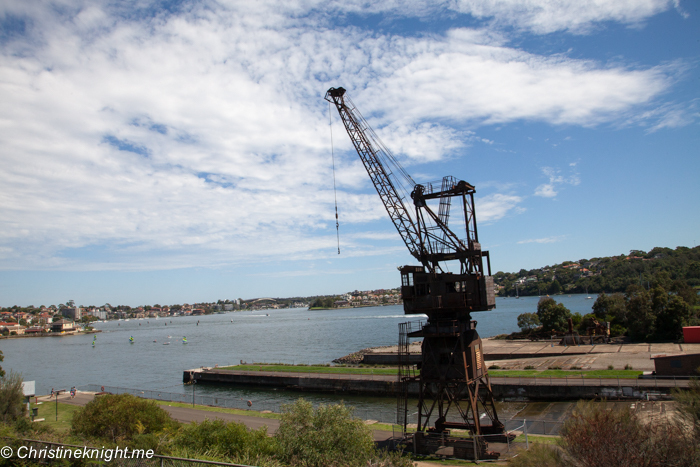 Sydney’s history hides itself in plain sight. 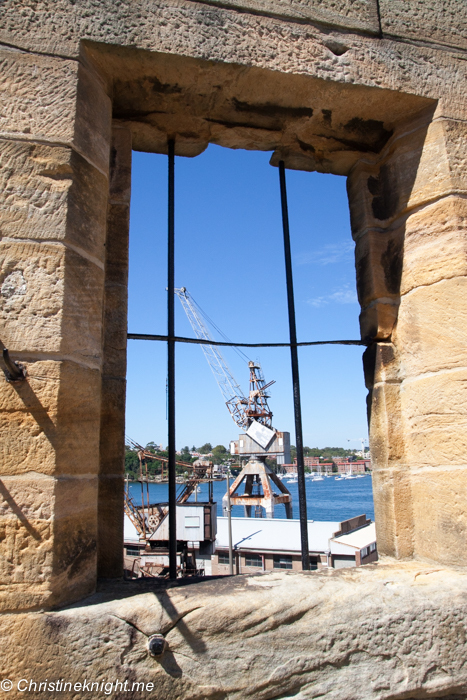 Scattered around the sparkling harbour and lush bush are pieces of a past that was built on the backs of convicts sent to the colonies to pay for their crimes committed far across the ocean. It’s easy to forget the past when you’re faced with the present and future. 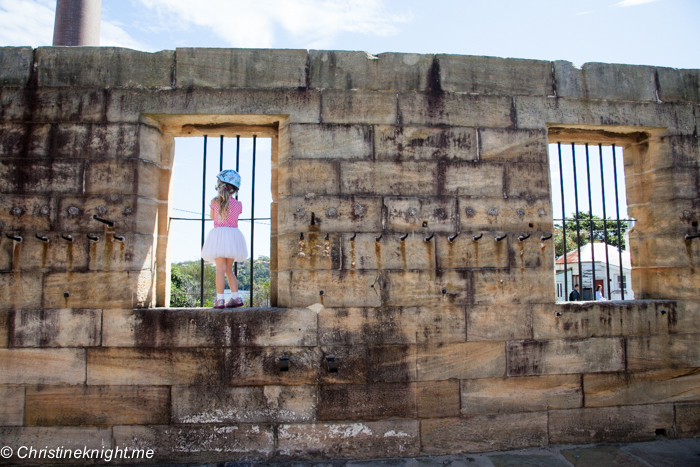 Sydney is a vibrant city renowned for its pristine beaches, foodie scene and wildlife – but scratch beneath the surface a little and you’ll find two hundred years worth of history ready to be explored by the next generation. 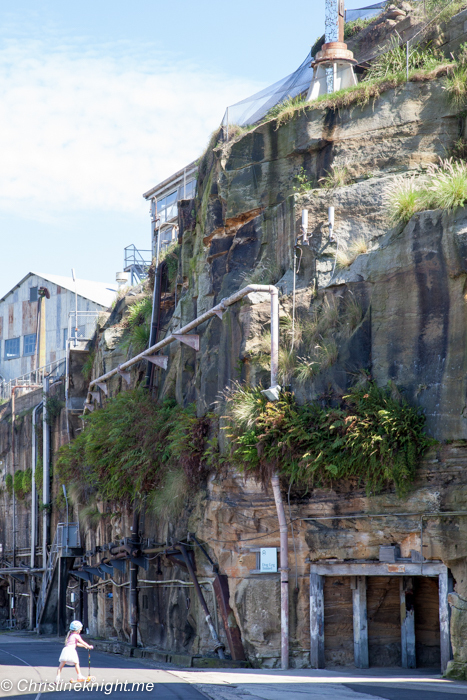 Cockatoo Island is one such place that is sitting right there in the middle of Sydney Harbour, rich with the past and full of tales to tell. 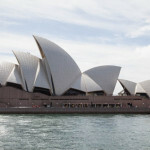 Before the First Fleet arrived at our shores, the island was frequented by sulphur-crested cockatoos and the Eora people, Aboriginals from Sydney’s coastal region. 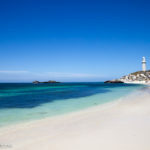 They called the island Waremah and would have used it as a base to fish from, making their canoes from the bark of the red gum forests that once covered the island hill. 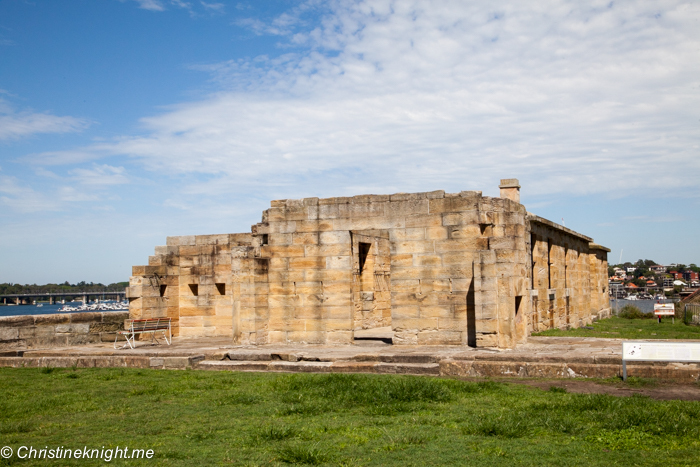 In 1839 the Governor of the colony of New South Wales, Sir George Gipps, chose Cockatoo Island as the site of a new penal establishment and put convicts to work building prison barracks, a military guardhouse and official residences – a rather less idyllic island life than the previous residents had enjoyed. 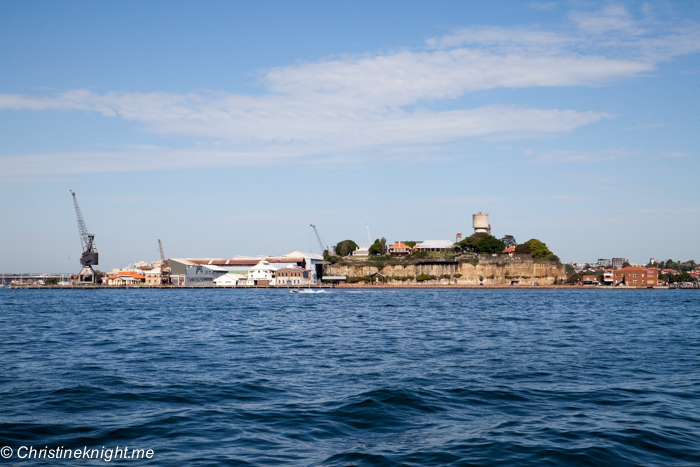 In the 175 years that follow, the island is used as a jail for “the worst of the worst”, a graving dock, a site for a girls’ reformatory, and a major shipbuilding site. 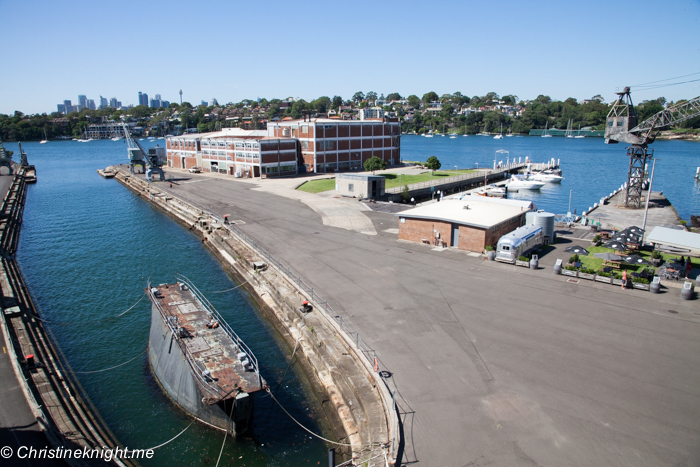 After the closure of the last ship dockyard in 1992 the island lay dormant until the Sydney Harbour Federation Trust restored the island and opened it to the public in 2007. 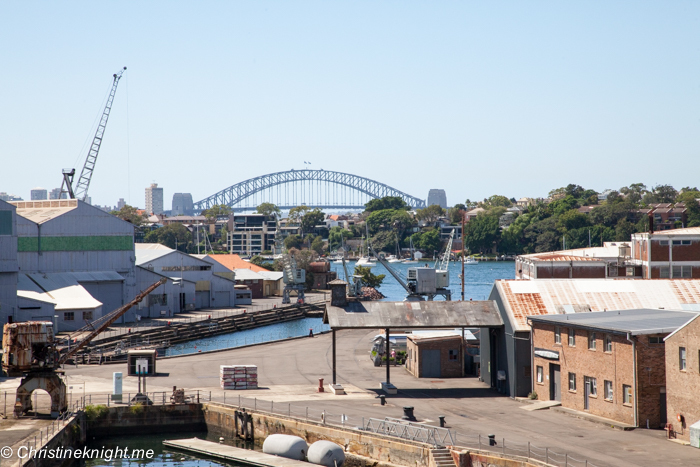 Since its reopening it has been used as a site for major films (see below for more details), events and art exhibitions, as well as a place for Sydney’s locals and visitors alike to discover the forgotten tales of its former residents. 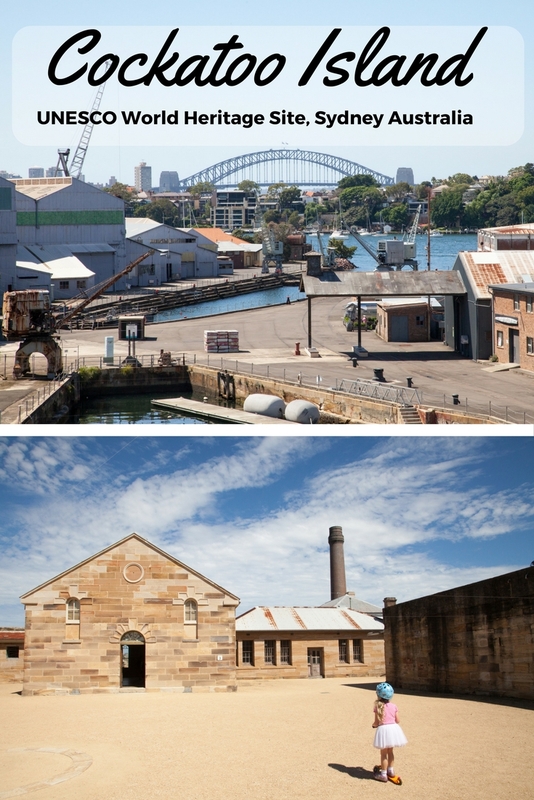 In 2010 Cockatoo Island, together with 10 other historic convict sites in Australia, was inscribed on the UNESCO World Heritage List, ensuring its stories will be preserved for all future generations to learn from. 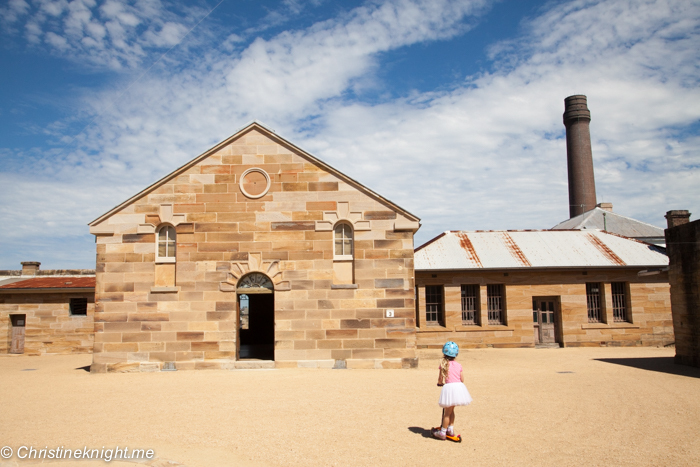 A visit to Cockatoo Island is perfect for the whole family, for people of all ages and abilities. 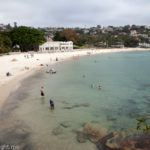 It can be as relaxing or active as the participants in your group want it to be. 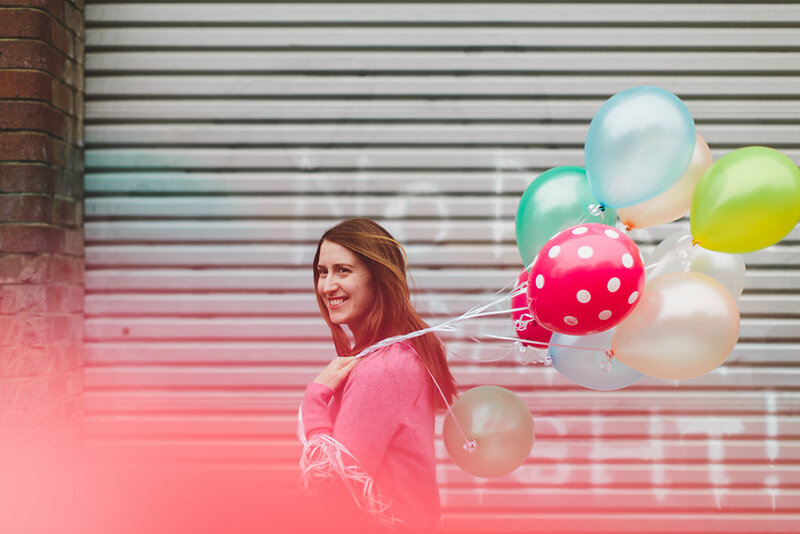 We visited with our very active five-year-old and have plenty of tips for those visiting with a similarly energetic party! 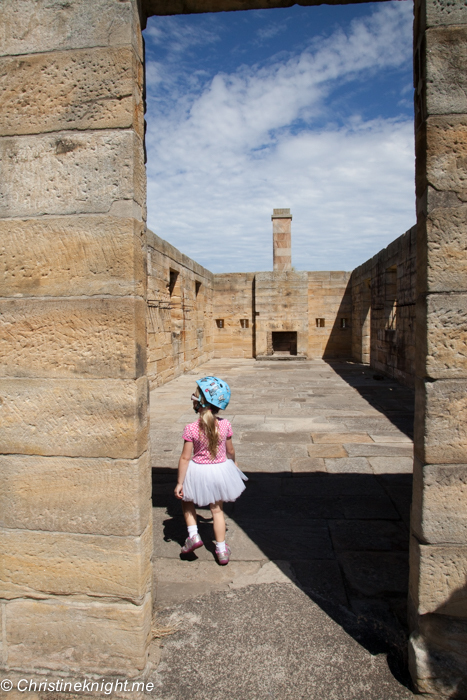 The island has plenty of flat cement ground for kids to scoot everywhere on. 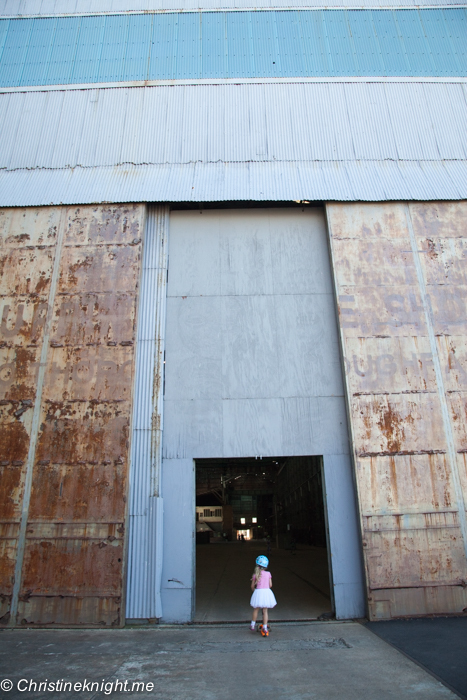 While we were reading the fine details on the history of the island, the kid was scooting off a storm and having the time of her life. 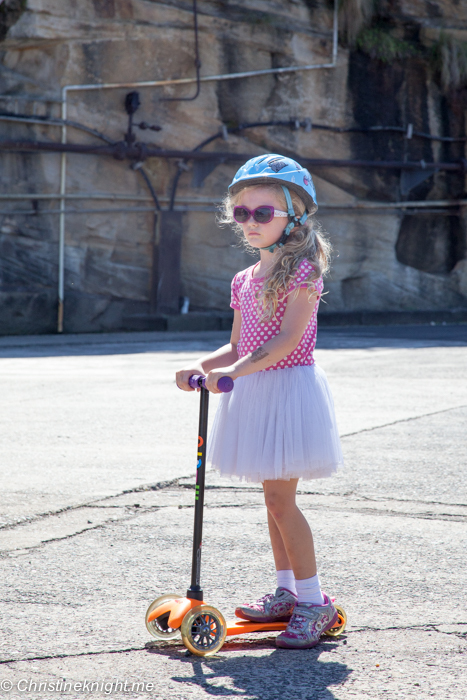 There was no complaining about tired legs or being bored, just one very happy scooting child. 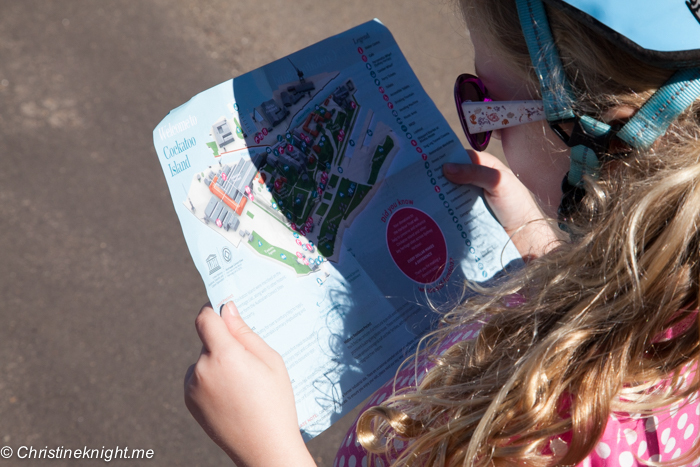 Ask at the Visitor’s Centre when you get off the ferry for a free kids’ activity pack. 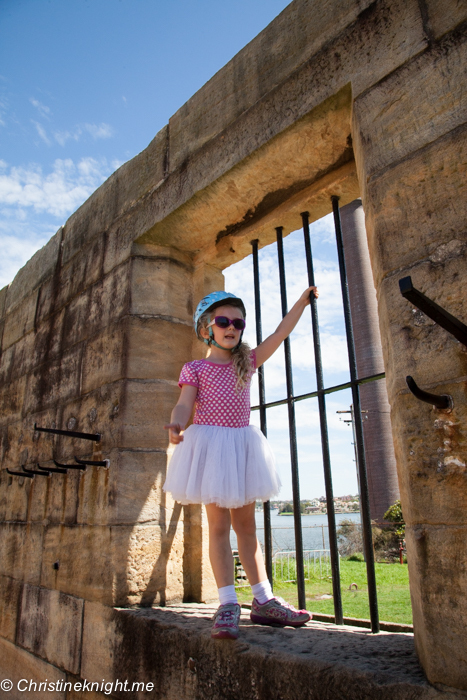 It sends kids on a treasure hunt around the island in a quest to find various clues and complete activities that engage them in the history of the island. Love it when you can blend education with some fun. 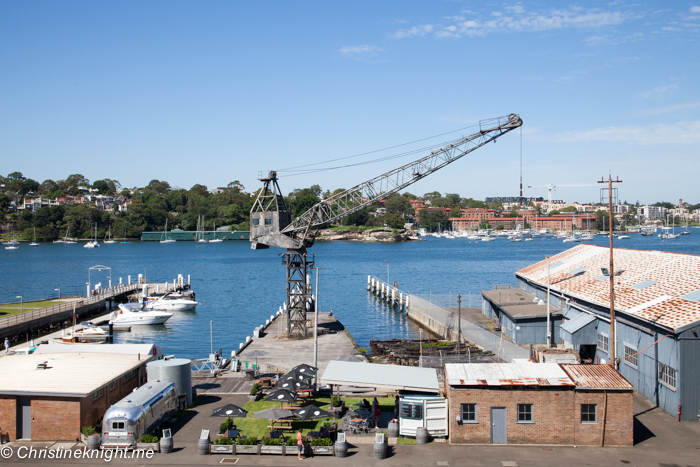 You’re free to bring your own picnic lunch and enjoy it on the island, but we really enjoyed our late breakfast from Societe Overboard, one of the two cafes on Cockatoo Island. 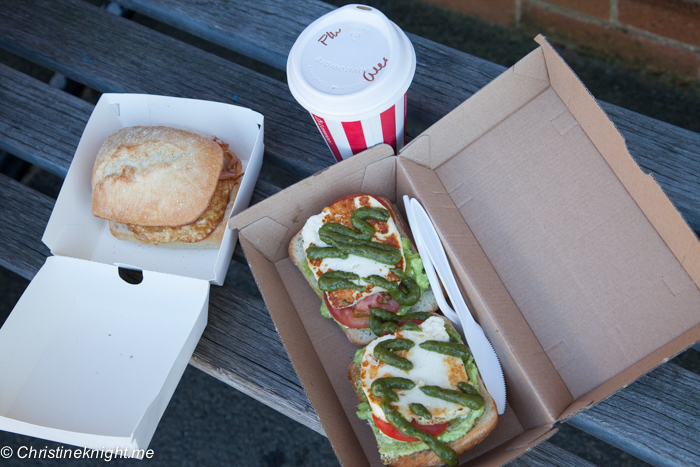 Societe Overboard is right near the ferry terminal and serves breakfast plus lunch items (we ordered the Brekky Roll for $9.50 and the Euro Bruschetta for $16.50). 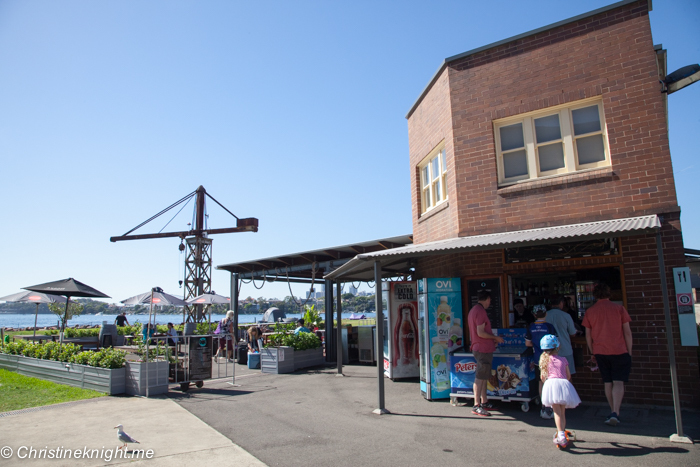 The second cafe is the Marina Café & Bar which is located just a short stroll through the Dogleg Tunnel from the main ferry wharf or through the Main Tunnel from the campground. 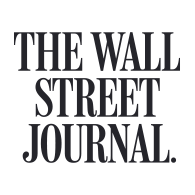 Their menu offers pizza, nachos, toasted wraps and more, including vegetarian options. 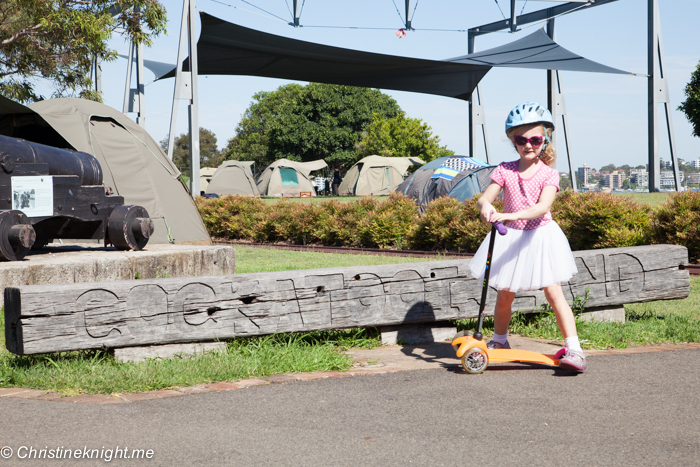 While there is comfortable accommodation available in the gorgeous heritage housing, the most fun to be had is glamping overnight in a tent with a killer view! 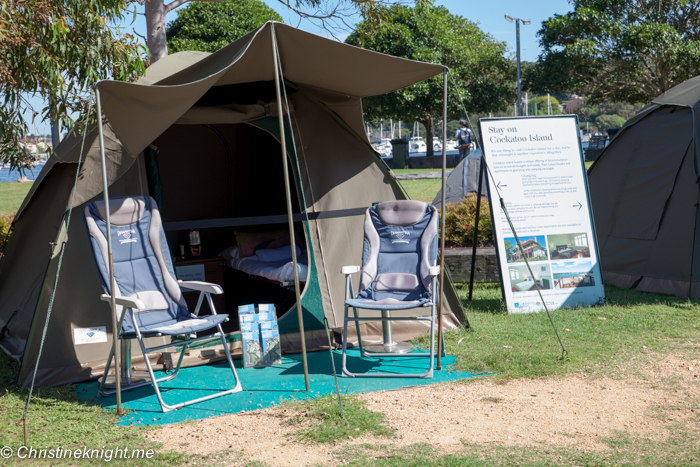 The Cockatoo Island staff set up the tent and bedding, even providing toiletries from Appelles Apothecary. All glampers have access to hot showers and communal camp kitchen with ten BBQ areas, fridges, microwaves and a boiling water system. 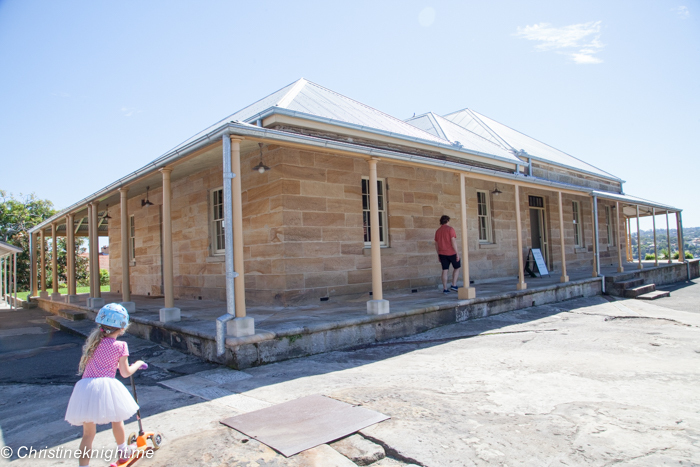 The Convict Precinct on Cockatoo Island is a lesson in the harsh living conditions and deprivations endured in prison labour. 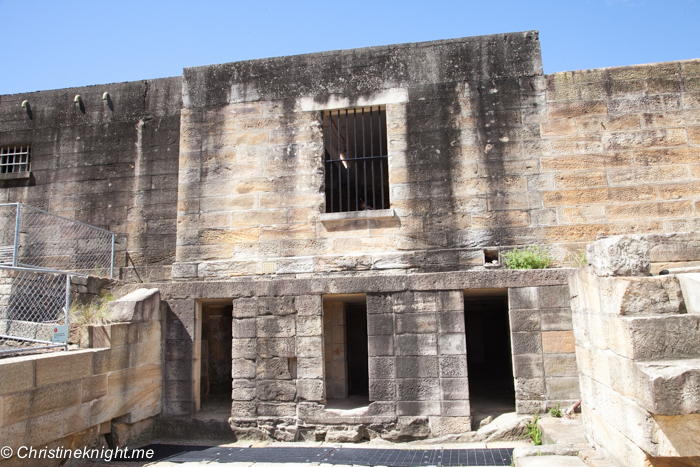 Convicts were put to work quarrying stone, building prison barracks, a military guardhouse, granary silos and official residences, forged their own prison bars and constructed the Fitzroy Dock with their bare hands, often waist deep in water and shackled with leg irons. 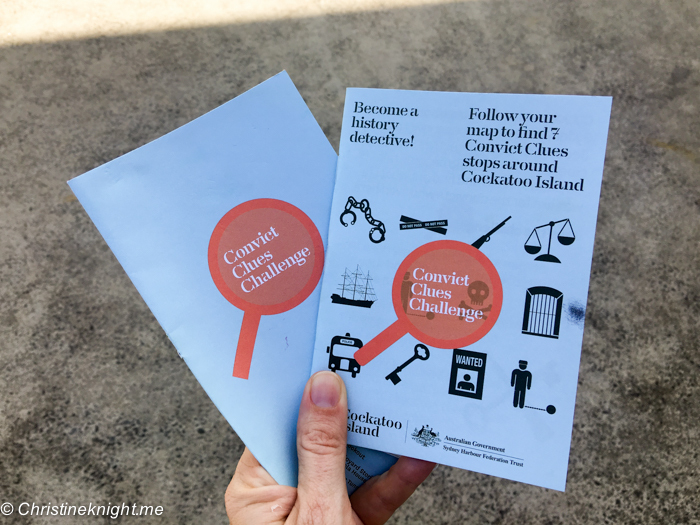 It’s easy to imagine the despair faced by the convicts who lived in appalling conditions on the island when you see first hand the brutal life they endured. 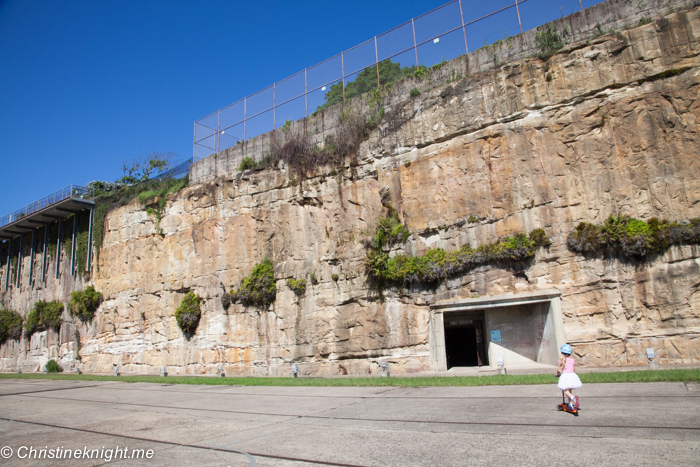 There are two tunnels that cut through the middle of the island, Tunnel 1 and the Dogleg Tunnel. 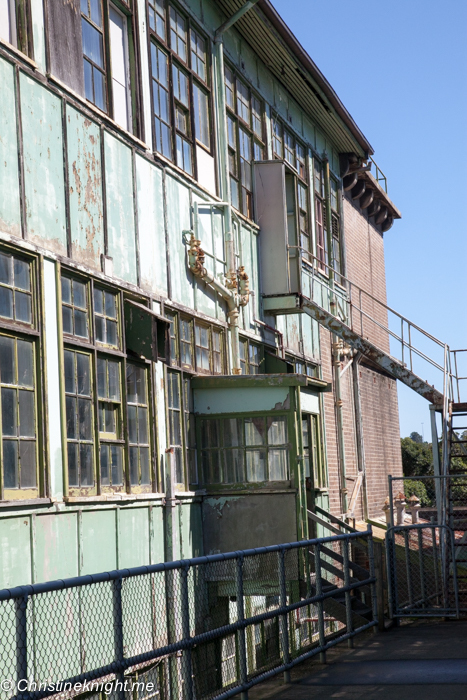 Both were built in 1915 to facilitate the movement of workers and materials from one side of the island to the other, and were later modified to become air-raid shelters during World War II. 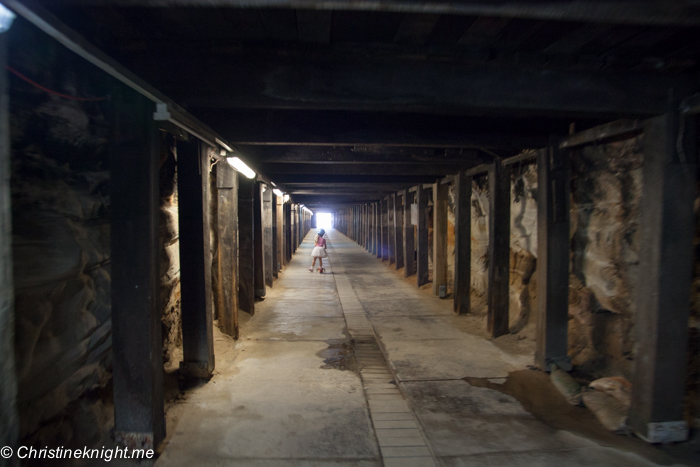 The Dogleg tunnel is seriously spooky as it has a giant kink in the middle (the “dogleg” for which it is named) so when you enter the 180m tunnel you can’t see where it ends. 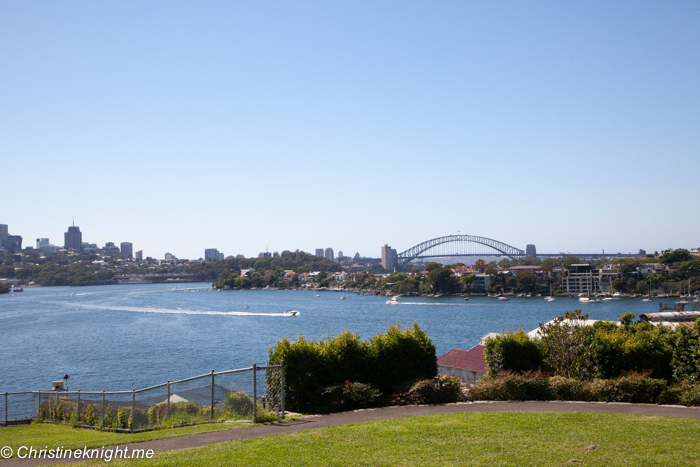 Walk up the hill or steep stairs (your Fitbit will thank you for it later) to Biloela House for stunning views of Sydney Harbour. 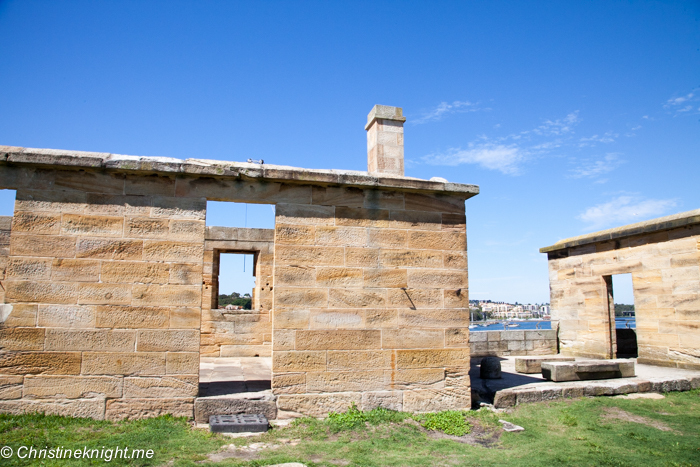 The sandstone house was built in 1841 and intended for the island’s Superintendent, hence the gorgeous location and building. 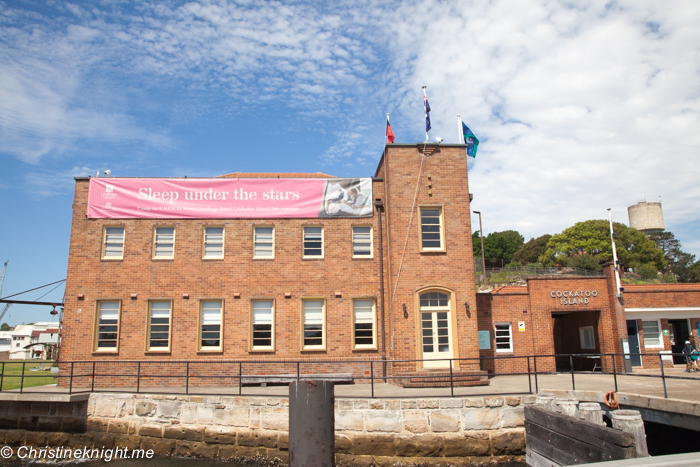 If you have time (and patient children) go inside Biloela House to check out the Shipyard Stories exhibition. I kid, I kid! 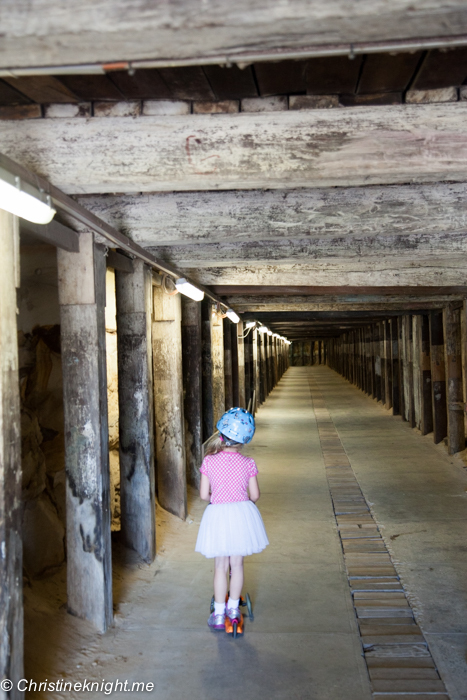 Seriously though, a brief look into these cells where prisoners were kept as punishment will give you and the kids a very quick education in how bad it would have been to be a convict on the island. 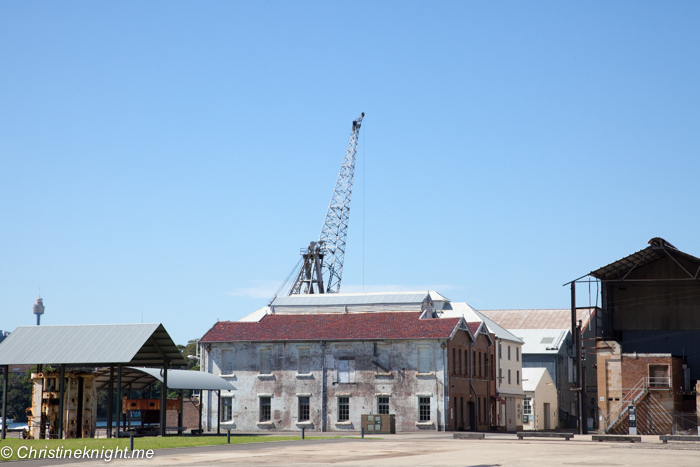 Cockatoo Island was also the site of one of Australia’s biggest shipyards that operated between 1857 and 1991. 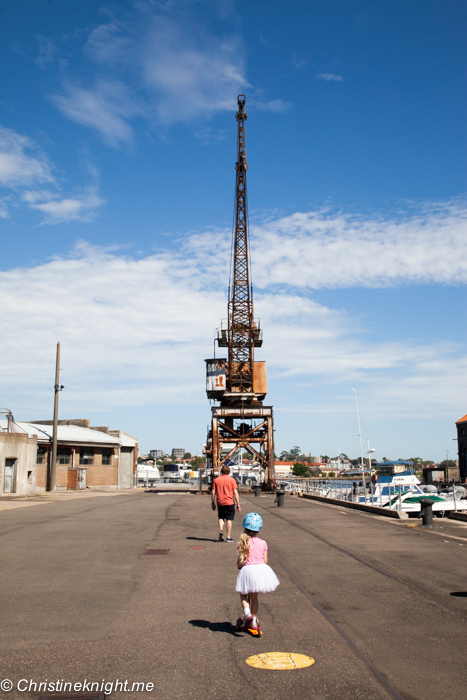 A walk through the yard will leave you in awe at the pure size and scale of the ships built here – and the cranes are always a favourite with the kids. 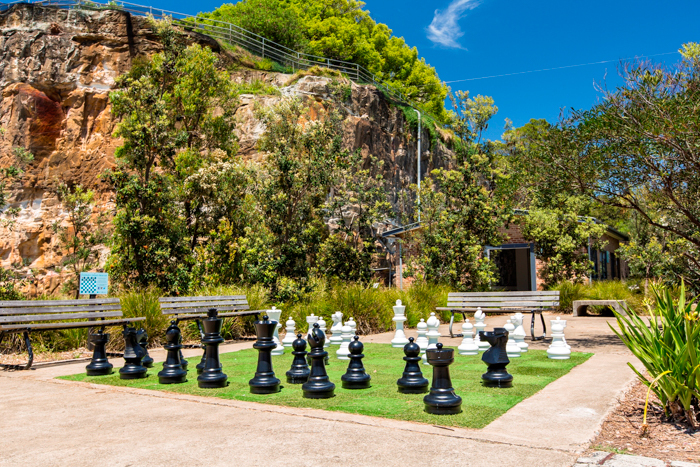 A life-size chessboard is set up near the ferry terminal for anyone to play – it’s the perfect way to teach young ones the rudiments of the game. 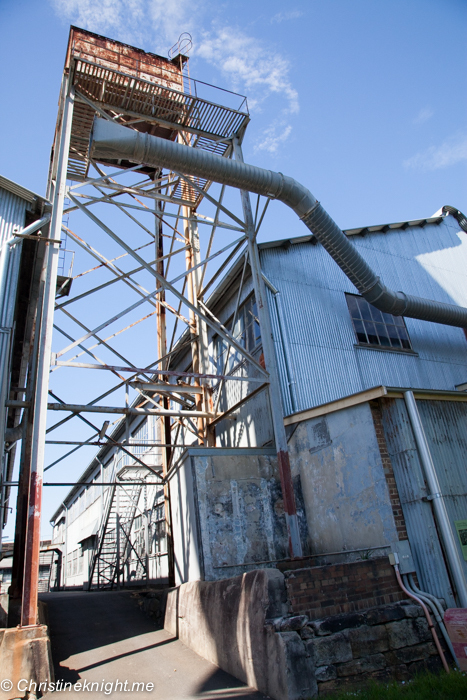 Cockatoo Island was also transformed into Japan’s most notorious Prisoner-Of-War camp Naoetsu during the 2013 filming of Angelina Jolie’s film, Unbroken. 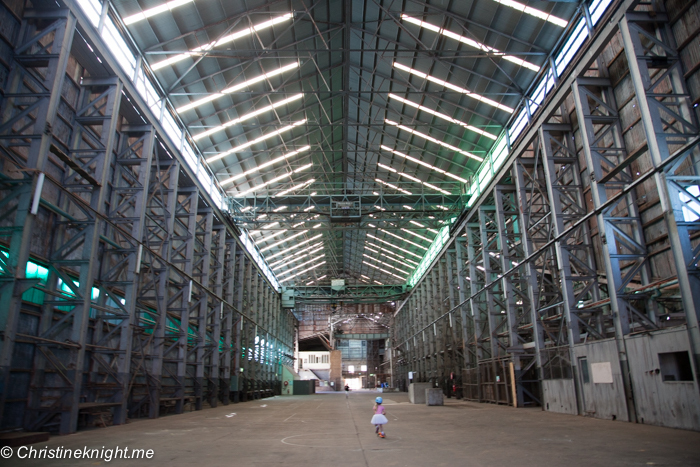 Want to know more about Cockatoo island? 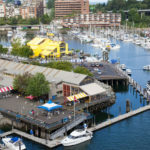 I highly suggest dropping by on Sunday March 26 to enjoy their open house event, a rare opportunity to take a sneak a peek inside the heritage houses and apartments. 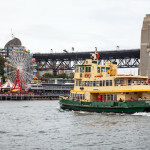 Catch the F3 or F4 ferry directly to the island. 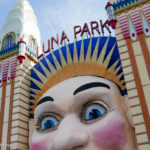 Our big tip is to use the unlimited travel on public transport for $2.50 on a Sunday. 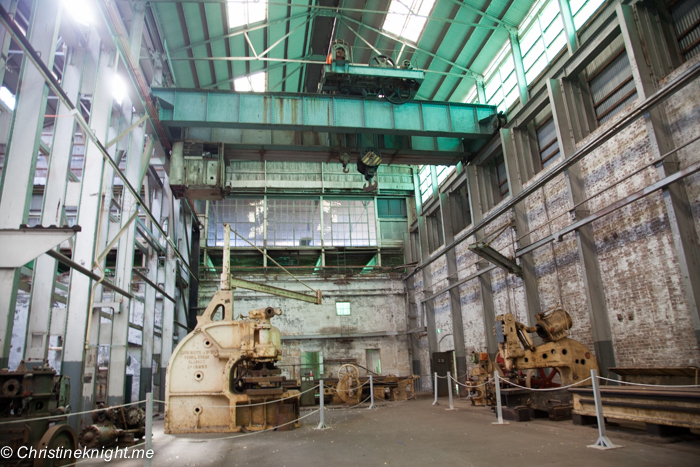 Learn more about visiting Cockatoo Island online.